Holidays can increase everyone’s stress levels. Let’s face it. Women suffer the most from holiday stress. Travel, family, late nights, non-stop eating, cooking, entertaining…it can zap your energy, put on extra pounds and turn you into a grumpy mess. Holidays mess with our hormones! Cortisol is up! You’re on edge, forgetting things, and making the sixth visit to the grocery store in two days. Yes, it’s the holidays! 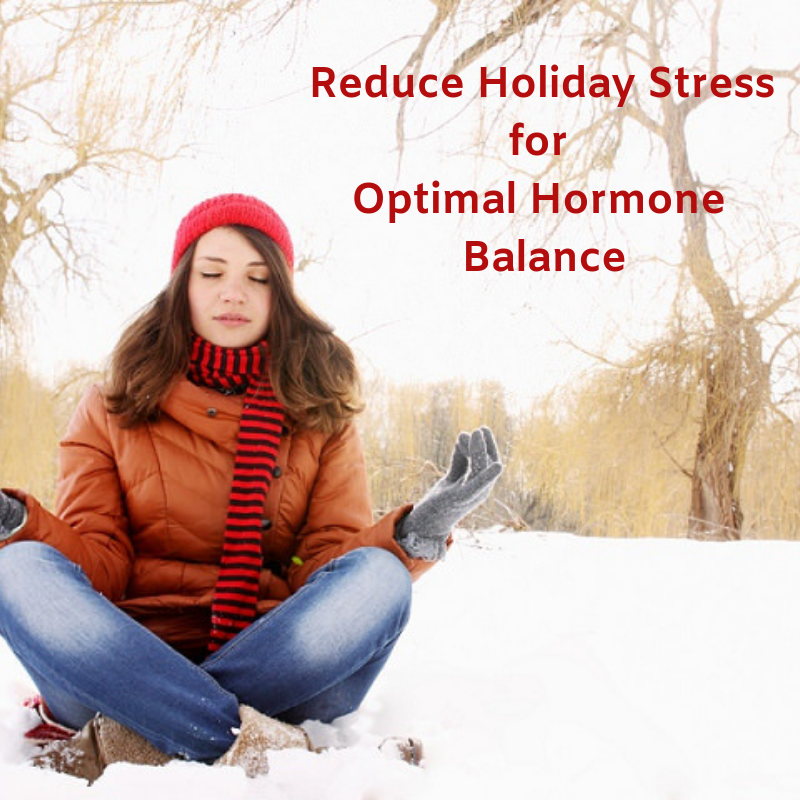 If you’ve been on the road to hormone balance, holiday stress can be an unwanted detour. Here are a few strategies to help you get through and maintain hormone balance without losing your sh*t.
Trouble sleeping or interrupted sleep is a common symptom of hormone imbalance. Diffuse or apply essential oils from the Hormone Help Premium Starter Kit. Lavender and Stress Away are great for sleep support. Apply throughout the day to maintain calm. I know it’s tempting but don’t skip your workout. This will be time well spent. Exercise helps you maintain balance. 3. Skip the stuffing and desserts…well, maybe just one piece! This will be my first Thanksgiving without stuffing. Honestly, my kids don’t get excited about it. I’m the one that loves the savory flavor of stuffing and dressing. It’s a holiday tradition. This year we’re skipping it altogether. In its place, I’ll have extra vegetables and a cauliflower casserole with bacon. Just typing this is making my hungry but my point is – skip the high card foods in favor or low carb veggies. High carbs and sugar set your hormones on a rollercoaster. My family will fill up on rib roast, turkey and ham this year. Protein is your friend. Our sides will be collard greens, kale, green beans and Brussels sprouts. Don’t overindulge in desserts. This is the season for pies and cakes galore. Satisfy your cravings and everyone’s desire to see you eat. Have one “small” piece and be done. No seconds. 4. Get some ME time. Women tend to want to please everyone. During the holidays there is added pressure to make sure everyone is comfortable, happy and well fed. Don’t forget that it’s your holiday too. Make sure you have some down time. If you’re cooking, enlist the kids and your husband to help with clean-up. Have relatives bring side dishes. Set aside time for a nap or a Netflix movie. Don’t go go go non-stop. Reduce stress levels with yoga, a few minutes of meditation, diffuse pure lavender in the room or read a book. To further support your adrenals take a B complex every morning. Vitamin B can help boost your energy levels while balancing your estrogen and progesterone. My B complex of choice is Young Living’s Super B. Supplements should be naturally derived for better absorption or bio-availability. Super B has eight vitamin B vitamins, natural folate and minerals magnesium, manganese, selenium, and zinc.